A historically good start for the Yankees. 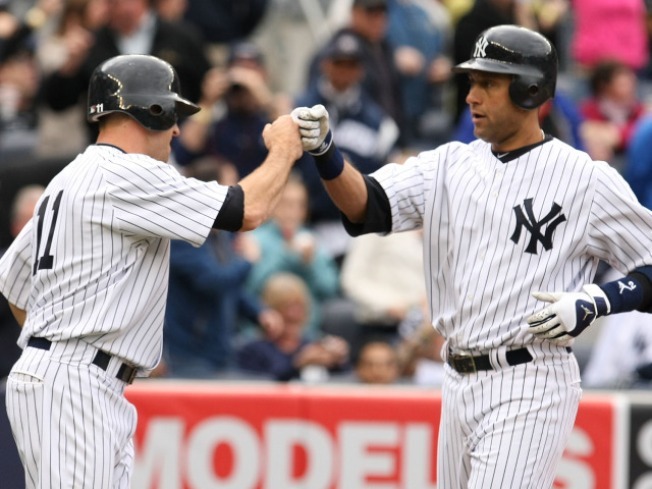 Here's your gobsmacking stat of the first two weeks of the 2010 baseball season: The Yankees have won their first four series for the first time since 1926. For those of you new to the game, there have been a lot of fantastic Yankee teams that steamrolled their competition in the intervening 83 seasons, so the fact that this year's squad has pulled off something that they haven't is worthy of notice. It might not mean much in the long run -- that '26 club wound up losing in the World Series -- but it's certainly a good sign for anyone worried that there might be some kind of a championship hangover in the Bronx. And even more impressive than the fact that the Yanks have won nine of their first 12 contests is the way that they've won them. They haven't been held under three runs so far and this weekend's sweep of the Rangers showed a team without a flaw at a moment when most teams are still figuring out who they are. Three dominant starting pitching performances, an enviable blend of speed and power and even Ramiro Pena singling home a pair of runs as a last second replacement for Derek Jeter and his case of the sniffles. They haven't made an error in 10 games, take advantage of every mistake their opponents make against them and that Mariano Rivera fellow still isn't willing to admit that he ages at the same rate as other human beings. The Red Sox, Rays, Angels and Rangers are all supposed to be playoff contenders this season and none of them looked deep enough to hang with the Yankees over the course of a five or seven game series. And that's without getting much of anything from Mark Teixeira and Javier Vazquez, two players who figure to author their share of highlights before everything is said and done this summer. It isn't always going to be this easy, of course, and all four of those teams have a lot of time to figure out ways to better hang with the Yankees before the calender turns to October. The Rays, with just one loss in nine games against teams not from the Bronx, are looking particularly feisty. Still, it's got to be hard for the rest of the American League to miss the message the Yankees are sending them right now. Try and catch us, it reads, and, right now, it seems inevitable that no one is going to figure out how to do that.